The infinite expanse of the night sky has long been the source of mystery and wonder. 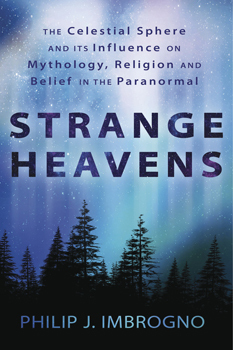 Strange Heavens explores the myths, religions, and spiritual experiences that have emerged from humanity's profound relationship with the celestial sphere. Join author Philip J. Imbrogno on a journey through time, as he describes the ancient fascination with the constellations and the Milky Way, the influence of the great astronomers and explorers of the Renaissance, and the evolution of science fiction and the role of space in the popular imagination. Discover unique perspectives on the role of gods, goddesses, aliens, angels, and other supernatural beings. Learn about the role of the heavens in ancient Greek philosophy, as well as fascinating insights from the early astronomers of China and India. Whether you're a serious observer of the skies or someone with a casual interest in the mysteries of the spirit, this book shares perspective and ideas that will change your relationship with the strange heavens forever.